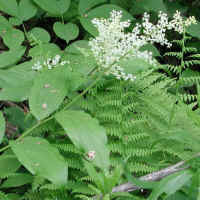 (Solomon's Seal, False - 01) False Solomon's seal or Solomon's plume grow in a sweeping arch that can be from one to three feet in length. 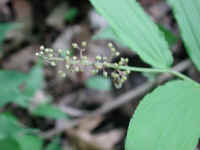 The crooked stem with alternately growing ribbed lanceolate leaves makes the false Solomon's seal easy to identify, even without its bloom or berries. 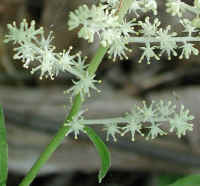 (Solomon's Seal, False - 02) The tiny 1/8 inch long false Solomon's seal flowers grow on a branched raceme from the end of the leafed plume. 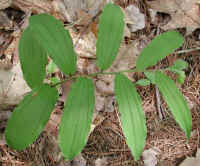 (Solomon's Seal, False - 03) The main stem of the raceme also bends slightly at each branch. 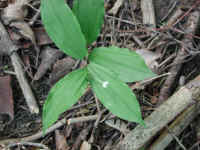 (Solomon's Seal, False - 04) In this photo, we can see the angular shape of the false Solomon's seal stem that bends at each leaf junction. 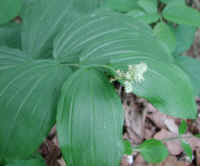 (Solomon's Seal, False - 05) The false Solomon's seal grow in wooded areas where they get filtered sunlight. A little glint of sunlight caught this flowering raceme which caused it to "glow" in contrast to the shaded area around it. 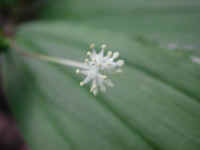 (Solomon's Seal, False - 06) This is another view of the false Solomon's seal bloom. 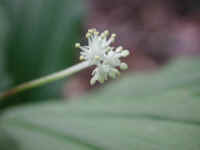 (Solomon's Seal, False - 07) This is another look at the blooming raceme of the false Solomon's seal. 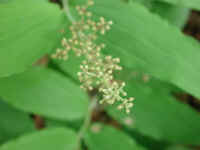 (Solomon's Seal, False - 08) This false Solomon's seal has recently formed its flower buds at the end of the arching leaf plume. 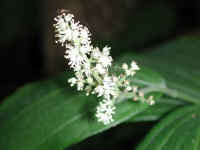 False Solomon's seal bloom from May to July. 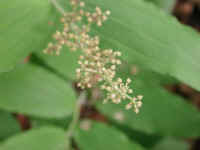 (Solomon's Seal, False - 08a) In this photo, we have a close up look at the budded raceme of the false Solomon's seal. 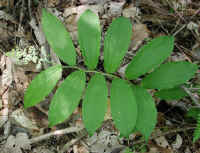 (Solomon's Seal, False - 09) This is a top view of a false Solomon's seal. 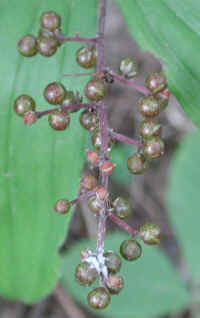 This photo also clearly shows how the leaves grow alternately along the entire stem. 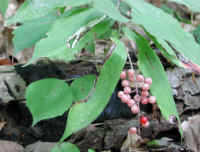 (Solomon's Seal, False - 10) By the end of summer, the false Solomon's seal develops berries which turn bright red in early autumn. 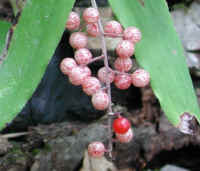 (Solomon's Seal, False - 10a) This is a closer look at the false Solomon's seal berries which have a speckled appearance that ripens to a bright red in early autumn. 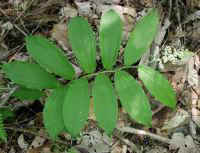 (Solomon's Seal, False - 11) This is another top view of a false Solomon's seal. (Solomon's Seal, False - 12) These false Solomon's seal flowers are just beginning to open from the bottom (right) to the top (left) of the raceme. 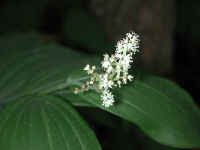 (Solomon's Seal, False - 12a) Each false Solomon's seal flower is 1/8 inch long and has 3 sepals, 3 petals (same size and color as the sepals), 6 stamens, and 1 pistil. (Solomon's Seal, False - 12b) By looking closely at these false Solomon's seal flowers, we can see the 3 sepals and 3 petals as a small starburst at the base of each flower. 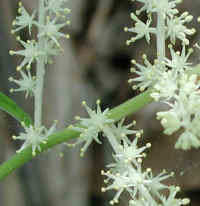 The 6 stamens are larger than the petals and have cone-shaped filaments with rounded anthers. The pistil is short and in the center. (Solomon's Seal, False - 13) This is a side view of a patch of false Solomon's seal that are growing in our yard. (Solomon's Seal, False - 14) We spotted this false Solomon's seal with what appears to be a shortened and damaged flowering raceme. (Solomon's Seal, False - 15) This is a closer look at the remaining flowers on the short raceme of this false Solomon's seal. (Solomon's Seal, False - 16) This is another look at the four flowers on the damaged false Solomon's seal raceme. 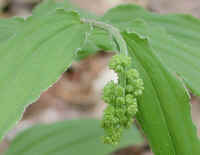 (Solomon's Seal, False - 17) This is a photo of the false Solomon's seal budded raceme. 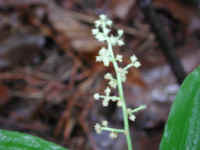 (Solomon's Seal, False - 18) This is another look at the buds on the raceme of a false Solomon's seal. 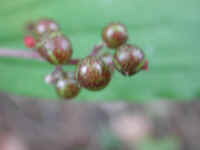 (Solomon's Seal, False - 19) This is another photo of the buds on a false Solomon's seal raceme. 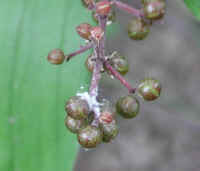 (Solomon's Seal, False - 20) This is a photo of the ripening fruit of a false Solomon's seal. We are not sure of the identification of the white substance. 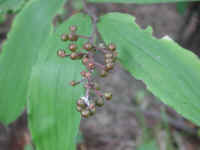 (Solomon's Seal, False - 20a) This is a closer look at some of the false Solomon's seal fruit. 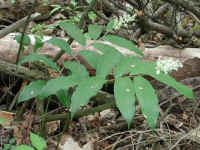 (Solomon's Seal, False - 21) This is a photo of the whole fruited raceme of the false Solomon's seal. (Solomon's Seal, False - 22) This is another look at some of the fruit of the false Solomon's seal. 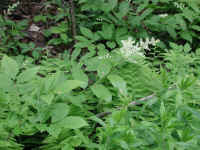 (Solomon's Seal, False - 23) This is a look at a patch of false Solomon's seal that is growing in the wooded area of our front yard. (Solomon's Seal, False - 23a) This is a closer look at the flowering raceme of the false Solomon's Seal. (Solomon's Seal, False - 24) This is another look at the patch of false Solomon's seal that is growing in the wooded area of our front yard. 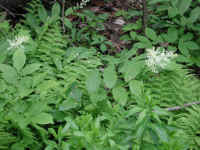 (Solomon's Seal, False - 25) This is a look at two blooming false Solomon's seal plants.